«Millions of children affected with AIDS» illustrated quotation. HIV/AIDS Day, free quote pictures for Facebook, Twitter, LinkedIn, Reddit, Pinterest and other social networks. 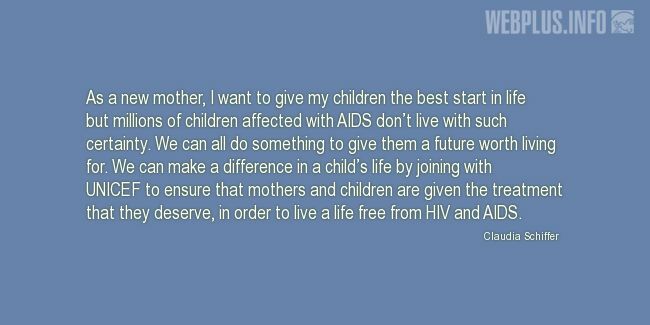 As a new mother, I want to give my children the best start in life but millions of children affected with AIDS don’t live with such certainty. We can all do something to give them a future worth living for. We can make a difference in a child’s life by joining with UNICEF to ensure that mothers and children are given the treatment that they deserve, in order to live a life free from HIV and AIDS.